Here is the solution for Not Charging problem like there is No Charging indication shows on the display when the battery charger is being a plug-in. 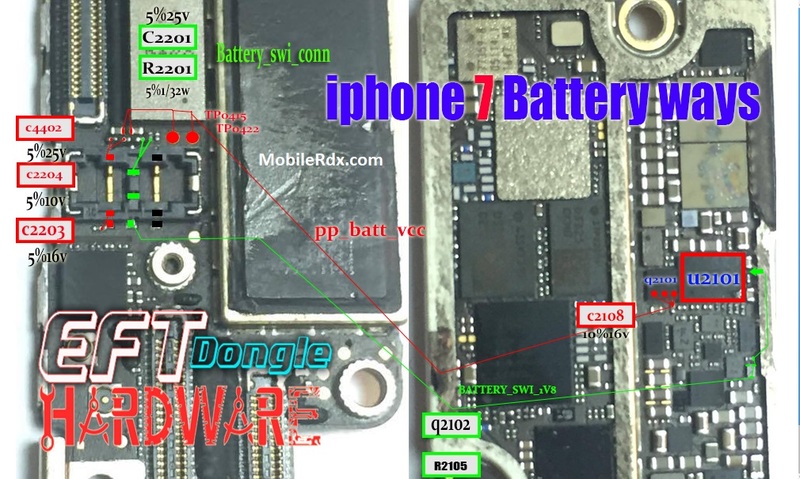 This problem is may cause by faulty components on iPhone 7 Battery Connector Ways PCB board. This problem may sometimes happen if the device suffered wet or water damaged or just exist. – Check all the components shown in the image below, you may start by checking the USB pin connector. Before doing, Be sure to check the battery and charger are Exactly working condition. then verify the phone’s USB pin connector is broken or any fault. Check the charging (+) and (-) line paths are short using a multimeter, if it shows short them, remove/replace the diode, capacitors and filters. also, replace the fuse. Note: use these work at your own risk. Check all the components shown in the image below. 1. Try to use another working charger. 2. Check, clean or replace the charging pin connector if oxidized. 3. Clean the charging pin connector terminal contact pads. 4. Check/ replace the fuse and the chip diode. 5. Check/replace the highlighted transistor, resistors, and capacitor. 6. If the above procedure won’t fix the problem, the possible faulty Charging IC. 7. Reheat, rework charging ic, replace if necessary.